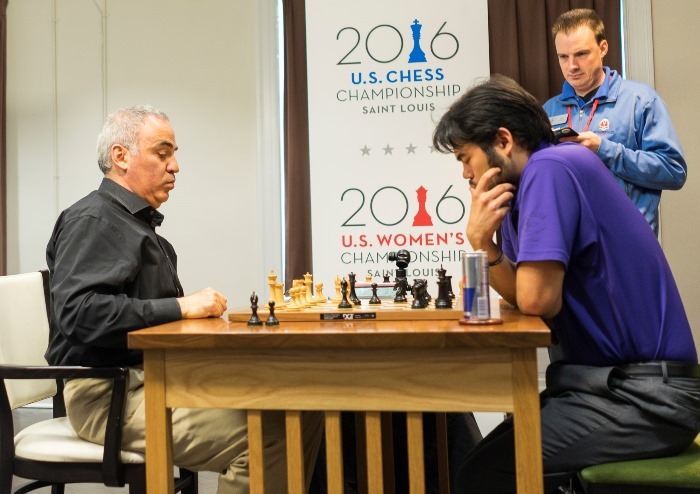 Hikaru Nakamura scored 6/9 on Day 2 of the Ultimate Blitz Challenge in St. Louis to win the $20,000 first prize by a full point. 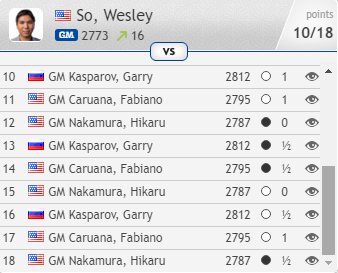 Second went to Wesley So, who played the tournament’s instant classic to beat Garry Kasparov in the opening round. 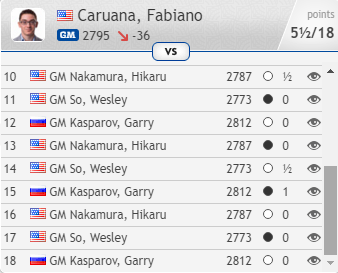 The chess legend finished half a point back in third place, but proved he still has what it takes to compete with the best, winning the mini-matches against Nakamura and Caruana. The US Champion finished in a distant fourth place. 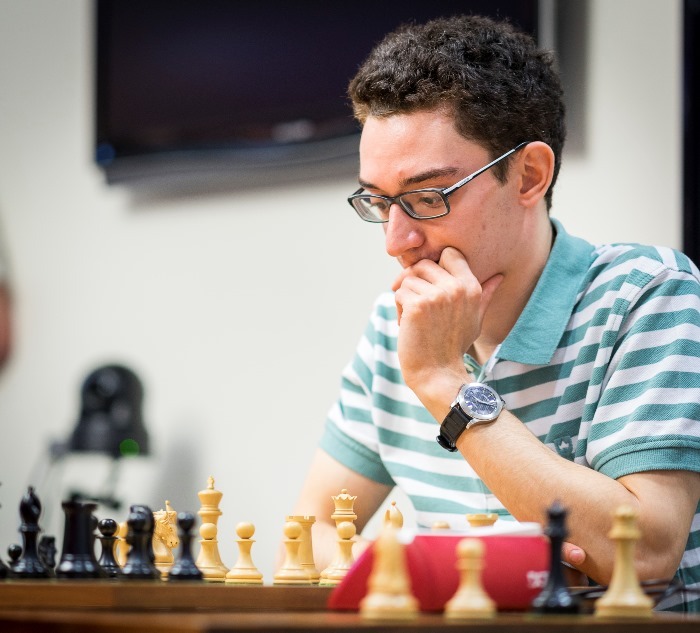 Fabiano Caruana leaves St. Louis a winner – the world no. 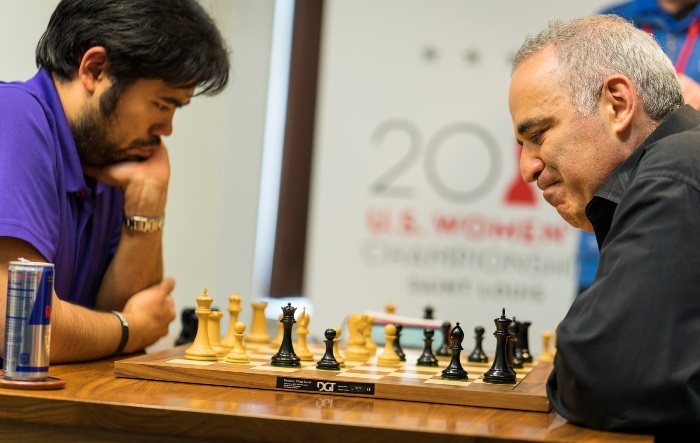 2 and the US Chess Champion – but he also left us with a familiar puzzle. How is it that such a phenomenally good player is so poor (relatively speaking!) at blitz? His rating is a mere 2665, making him the world no. 85 in the format, with Veselin Topalov almost the only other elite player whose classical results are so different from those in speed chess. 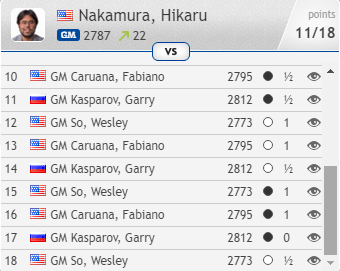 His victory over Nakamura in last year’s Showdown in St. Louis looks like an anomaly. There was one player who really didn’t play well today and that was Fabiano. Because of that several of us were able to rack up a lot of points - that’s what made the difference. It can also happen in classical chess, but in blitz it happens so much more suddenly and it’s really hard to stop it. The games just come one after another. If you’re not playing well it’s very easy to lose a bunch in a row. It’s probably not a closely-guarded secret that for now blitz chess is a weakness of Fabiano’s, and one that might prove a liability at every stage up to and including a World Championship match. 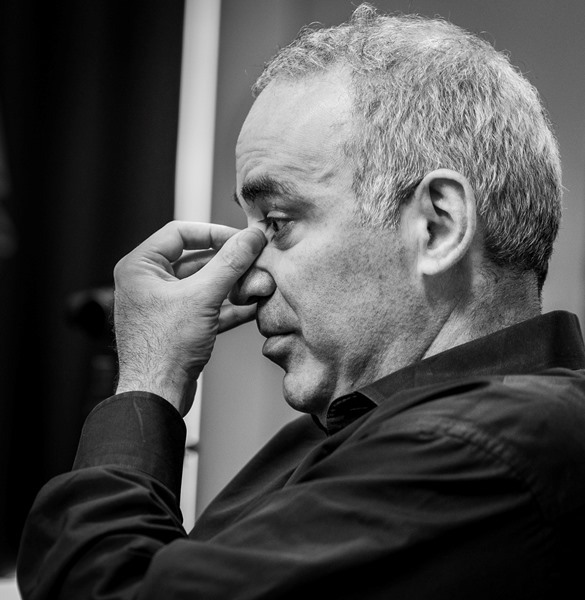 After a crushing loss in the first game of the final day – of which more later – it seemed the fairy tale might have ended for Kasparov. Were we about to see a return to harsh reality, where the 53-year-old retiree would get knocked about by some of the hungriest stars of the new generation? The answer was a resounding no! Garry went on to lose only one more game and kept up the fight for the top places. 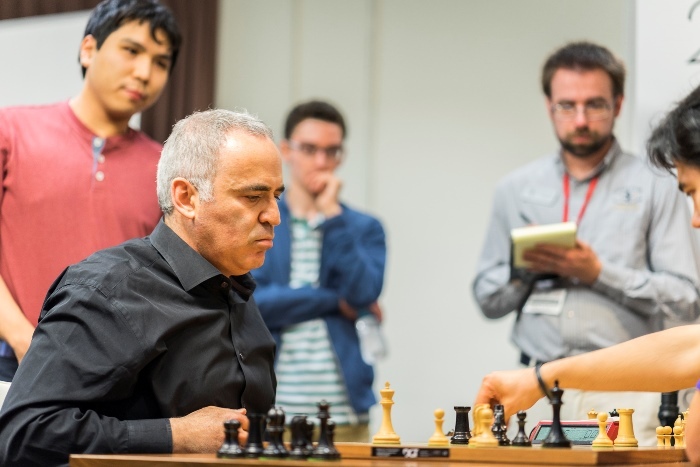 In the first two games against Nakamura they traded missed winning chances, while in the third Nakamura succumbed after getting into trouble in the opening and making what Kasparov called the “unexplainable” decision to give up a piece on move 13. Sometimes old memories are revived. I played this move 9…Bf5 against the British player Webb in the first round of the European Team Championship in 1980, and it was my first actual game for the Soviet national squad. I was the second reserve. He played 10.d4 e4 and I think he played 11.Ng5 Re8 and I was very proud with this move Bf5 because it allowed me to meet d4 with e4. I won a very nice game. His knight was rotten. Kasparov was, of course, absolutely right, as you can see from our broadcast. 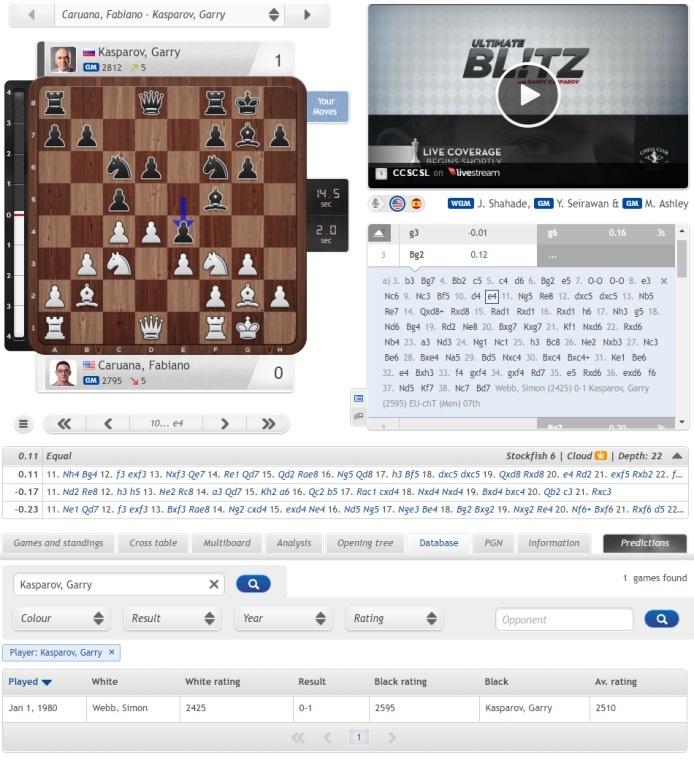 Note the new searchable database, that made it possible, for instance, to watch Kasparov’s games live while almost instantly showing any games he’d previously played in the same positions! The way Caruana played it was so easy for Black because I could build my momentum there and it reminded me of the last game I played with Nigel here, because it’s also having all the pieces there. It was easy, but still, I enjoyed it! I liked the moment when I could sacrifice on g4 just to keep all the pawns out of the board and then just to have the final attack. The Rh8, Kg8, Bf8 was nice. A nice finish! I’m quite happy. I won two micro-matches, I ended plus one, so I did better than many expected… Yesterday I missed my chance. Just not blundering these two knights – scoring probably a point and a half against So in these two games – that would be a very different tournament. 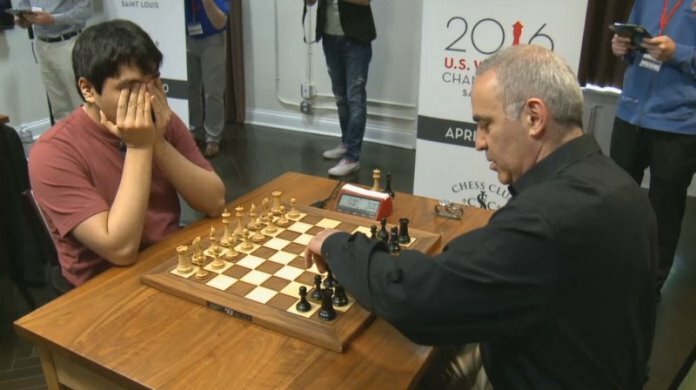 He won $10,000, but is giving that away to support the US chess team at the Olympiad. Why? I’m an amateur, I’m not a professional player! So they were gracious, they wanted to play this event and I thought it would be nice if I make the donation. I hoped it would be a bigger donation! 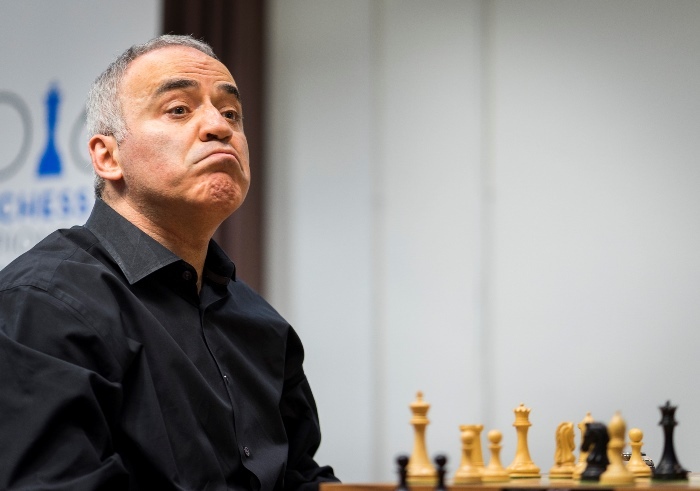 The other players gave their verdict on Kasparov’s performance. I think Garry’s preparation was quite good for this event. Obviously chess has changed and you can’t just win games out of the opening, but he did find ways to create positions where it was much easier for him to play than it was for us. When that happens in normal games it’s a challenge, but when it happens in blitz, where you don’t have a lot of time to figure it out, it becomes especially tricky. I thought Garry was quite good at that today. He probably should have finished in second, I think. The main thing is it’s clear that he’s not done. He’s still quite competitive and I think if he’s competitive I don’t know why he shouldn’t play. Playing normal tournaments takes too much time and it’s a real grind, especially at his age, but still, he’s a competitive player and these exhibitions… I don’t see any reason why he shouldn’t. I think it’s very good for chess. I was kind of shocked when I lost my first two games in this tournament, because I didn’t realise simply how powerful my opponents were and I didn’t expect Garry to play the same exciting, energetic chess as he did before. He played extremely well and I was fortunate to save a lot of games against him. He’s still a very strong player. I don’t think that really came as a surprise to anyone. Especially at blitz he still has fantastic instincts. Those really go a long way. Opening preparation and knowledge of current opening trends and what’s happened for the past decade is much less relevant. He does occasionally blunder, he’s definitely a lot weaker than at his peak, but he’s still a very, very good player. Right now, being fresh after two straight victories against Nakamura and Caruana, I’m inclined to say yes, yes, yes! But remembering my emotions last night, this morning, I’m not so sure. I think I’ve proved that I could play against them, so it’s a lot of fun. Maybe, but if I take the challenge again I would probably do more serious preparation because you have so many things floating in your head at my age – family, you have other things, I have lectures, I have writings, I do a lot of stuff on Twitter and Facebook, the political appearances. Then you have to think about the Scotch, you have to think about other things! The problem is many positions are difficult for me to play because I don’t have the practice. They play some positions so often, like the Berlin or the classical Ruy Lopez or the Queen’s Gambit. I know how to play them, but in blitz it’s very difficult to take this challenge, because it’s all about instincts and they’re much better prepared for that. If it happens again I will probably look at some other ideas, but when I had my chance to attack and just sacrifice some material I did well! Garry was straight back on Twitter after the event! 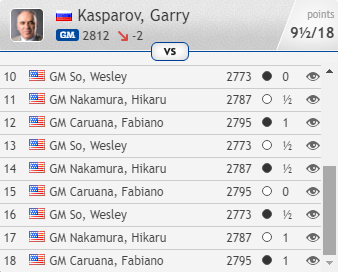 Wesley So almost single-handedly prevented Garry Kasparov from challenging for first place in the Ultimate Blitz, scoring 3 wins and 2 draws against the legend after losing to him in the first game of the tournament. It was a tough night actually, because I just couldn’t get rid of these horrors, these blunders. Actually the worst memory of yesterday was not a blunder but the way I played against Wesley, so it probably had a psychological impact on me, so that’s why I played so poorly against him today. I will remain in awe of that blitz game for the rest of my life. I just thought watching that unfold was unbelievable. The dynamic aggression Wesley showed in that game, sacrificing one pawn, two pawns, the knight, the rook – it was just poetry! 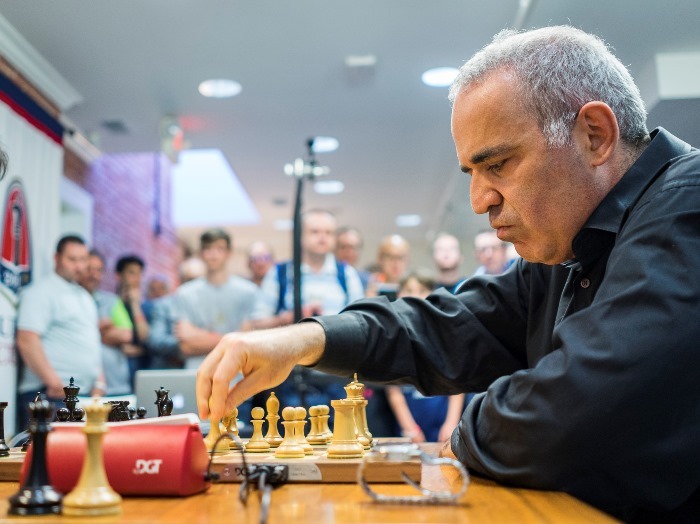 To do this against the immortal Garry Kasparov is just incredible! He finished very, very nicely. It’s a beautiful game, but it reminded me of the games Morphy played with amateurs – I was an amateur in this game! It was a total disaster, but ok, it’s a nice game. If he could be criticised for one thing in the tournament it was for taking a draw at the end, but it was a position it would be almost impossible to win, and if he lost it would have cost him not so much money (he’d be $2,500 poorer after sharing 2nd-3rd place with Kasparov) but the bragging rights of finishing above the former World Champion. It’s just yesterday I was not seeing anything. Every game yesterday I was losing at some point, there’s no doubt about that. If you play one bad game, two, three, it can happen, but to be much worse to lost in every single one… I just wasn’t there yesterday, but today things went a lot better for me – pretty smooth, I would say. He lost his only game when he was already leading by two points with two rounds to go. That was unfortunate. He played the same variation as he did yesterday in the Queen’s Gambit Declined and he had some improvement and some new ideas of a setup and then I simply became too passive and too comfortable in my position. I thought I had a solid position and then suddenly he took my pawn on b4. 39…Bd4! and the a-pawn queens. To not win something here would have been a little disappointing. I’m just happy that I was able to play well today. I feel like the last couple of days I’ve just been starting to lose it a little bit – just too much chess since February. It’s kind of the end of a long, long series of tournaments and I’m just happy that I was able to win today and now I can relax for a few months… I’ve been on the road since early January. It’s been a lot of chess, a lot of travelling, a lot of ups and downs, especially at the Candidates. I’m glad I can get a break! 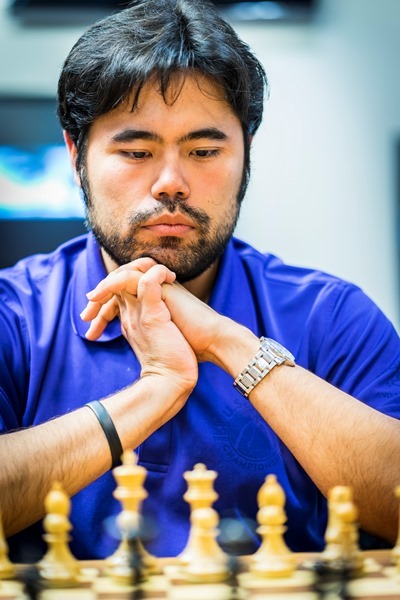 Nakamura’s next event will be the Grand Chess Tour rapid and blitz tournament in Paris in early June, but we don’t have to wait so long for major chess action elsewhere. There’s the Italian Team Championship, the final weekend of the 4NCL, the Hasselbacken Open, the German Club Cup, the Batumi Women’s GP and the likes of Kramnik, Aronian and Svidler are heading to Sochi to play in the Russian Team Championship from tomorrow. Follow all the action on our Live Tournaments page!